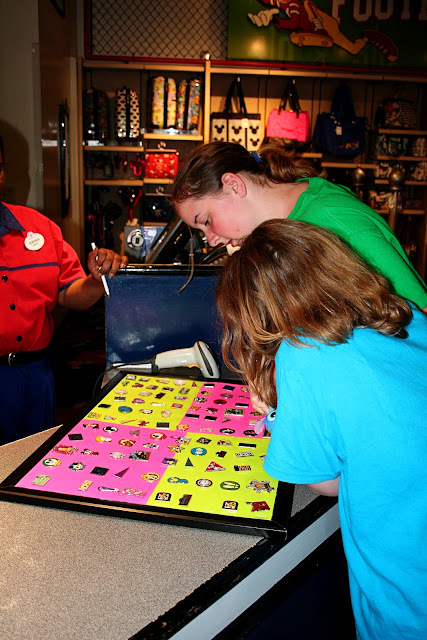 Keys to the Magic Travel: Pin Trading at the Disney parks and a GIVEAWAY! 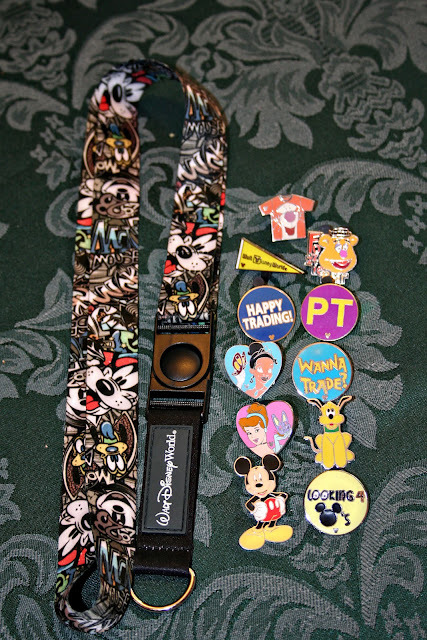 Pin Trading at the Disney parks and a GIVEAWAY! 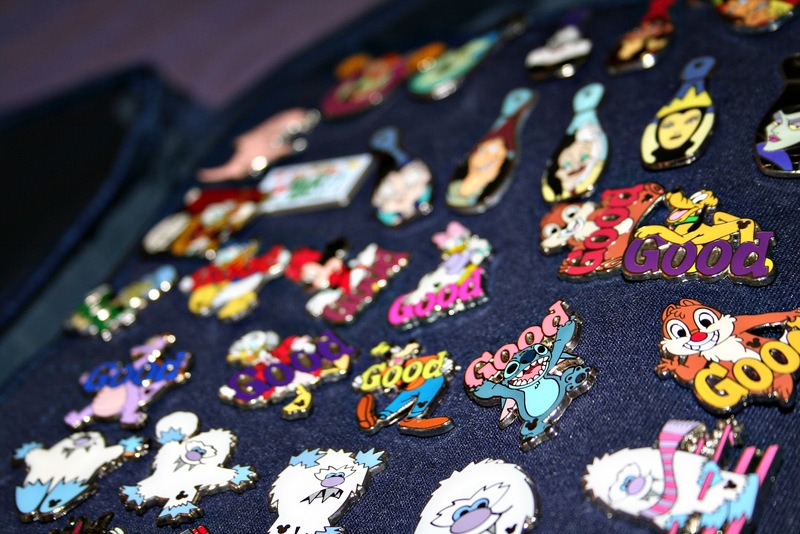 The first time we took the kids to Disney, I had heard about pin trading, but I wasn't quite clear on all the specifics. I thought that if I didn't mention it, my kids wouldn't know about it. And then we could just pretend that it didn't exist. 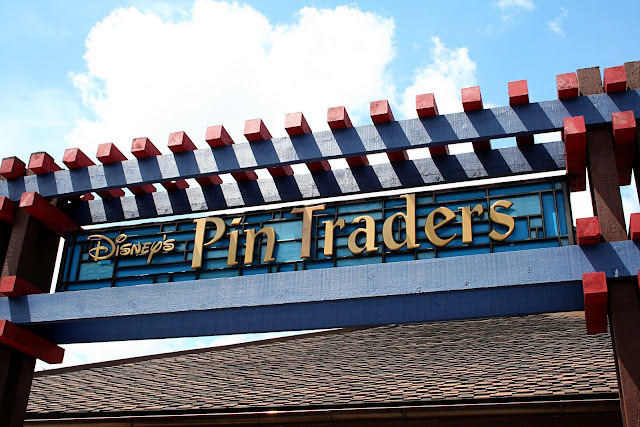 Not that there is anything wrong with pin trading - but it seemed like it was something else to do and we already had so much on our agenda. However. Instantly. My kids were mesmerized. They looked at the colorful pins in the stores. They went up to talk to cast members - asking to look at their pins. They talked to people in line and asked to see their pins. They talked to our neighbors while we were eating meals - asking to see their pins. As you can see - it was on our agenda no matter what. 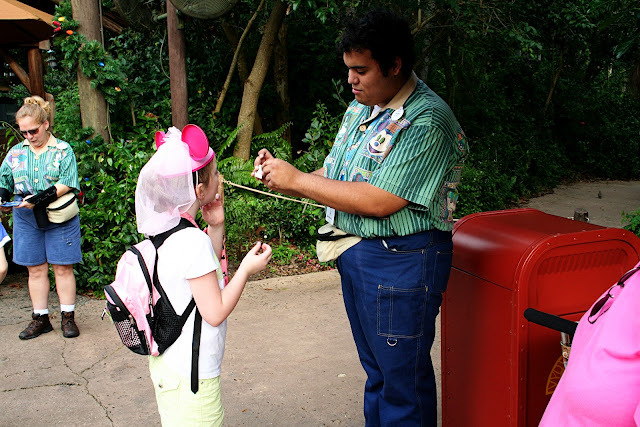 If you’ve ever been to Disney World, you’ve probably seen cast members and park guests with lanyards on their necks full of pins. That’s because they’re pin trading, which is a simple yet really fun way to spend time at the Disney parks. But how do you start pin trading? That is super-duper easy. You can buy a starter pack, which usually contains 5 to 8 pins in them, depending on which starter pack you buy. You’ll also need something to put your pins on. Most people opt for a lanyard, which come in a few different lengths. Getting all of these things is also pretty easy. All of the parks have somewhere that sells pins and lanyards, and there is even a whole store dedicated to it in Downtown Disney. Once you have your pins, then what do you do? You trade them, of course. Many cast members have pins, and when they do it’s pretty obvious. Some will have the neck lanyards and some will have smaller square hip lanyards. Usually the lanyards will be black, but if they are green that means they only trade with younger kids. Sometimes they will keep pins hidden, displaying the pin back instead of the front. This is a mystery pin, and you won’t know what it is until you get it. 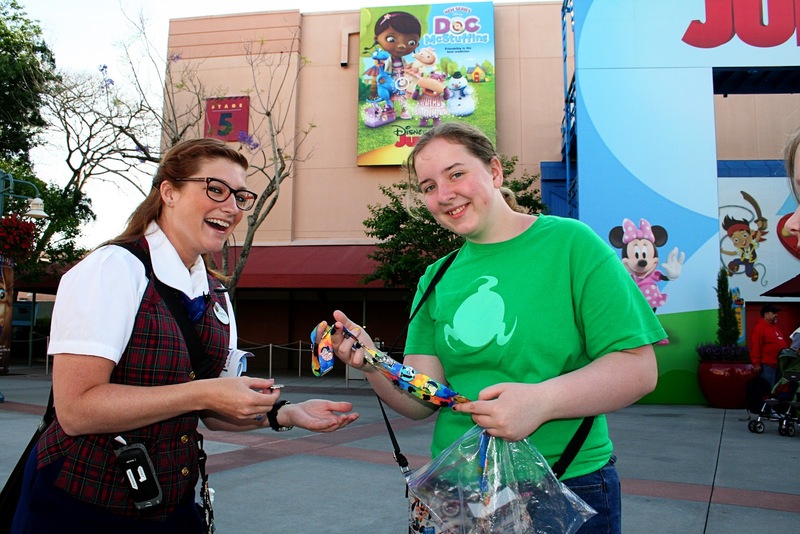 I’ve even found a cast member with a lanyard only having mystery pins with colorful backs shaped like Disney characters. 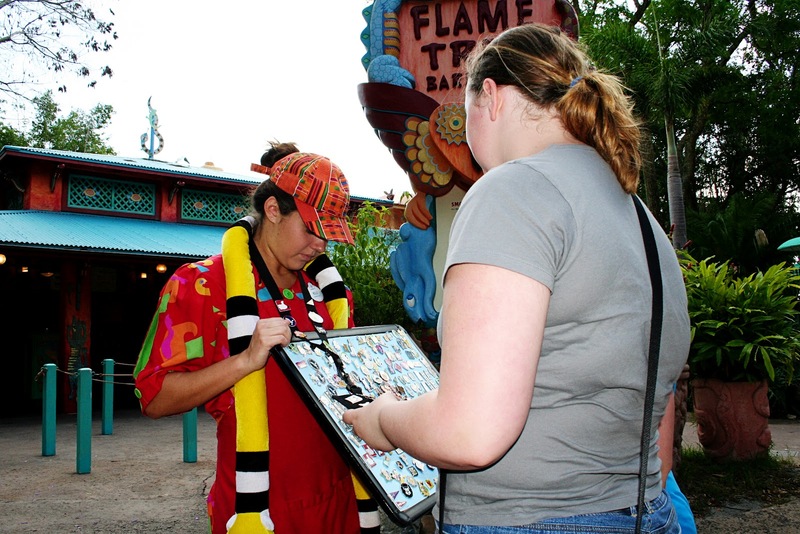 You don’t have to exclusively trade with cast members. 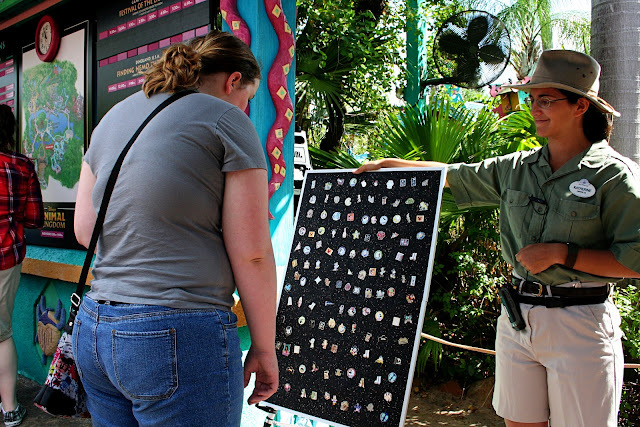 Cast members give you the benefit of giving you whatever pin you want and not caring what you get in return, but there are also other people around the park who may be willing to trade. There is no clear way to know if someone else is willing to give up their pins, but it never hurts to ask. Sometimes in stores they will have a pin board out. They often vary in sizes, but are usually not very big. Most of the time they have a two pin trades per board policy, and often have at least one really good pin. Many pins will have a silver Mickey Mouse head somewhere on it. These are called “Hidden Mickey Pins” and you can’t buy them in stores. They only come through cast members. They always come in different sets with different themes. There is one with Disney villain faces on bowling pins. There is another with a Disney character for each Zodiac sign. There are two different sets with a character for each letter of the alphabet, one from Disney World and one from Disney Land. 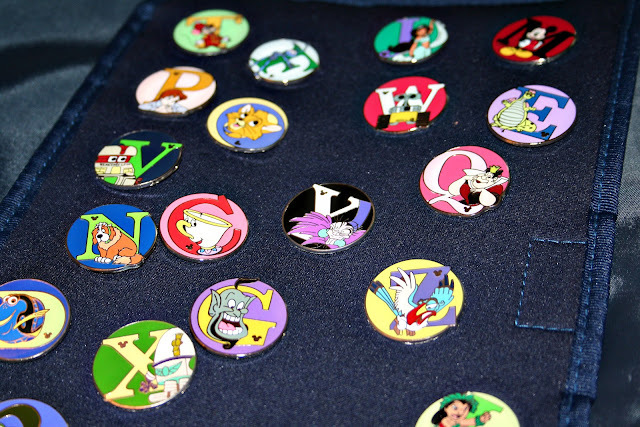 The pins originating from Disney World are all circular, while those from Disney Land are shaped like the letter. One of my favorite collections is the topiary collection. These are pretty hard to find, and they were the first hidden mickey pins released. It consists of Mickey, Minnie, Tinker Bell, Dumbo, and Ariel. If you’re like me and REALLY like pin trading, you may want to get a pin book. Trust me, there is only so much space on a lanyard that you can use. It’s really useful especially if you’re collecting because it keeps things organized much better than a lanyard. Pin trading is one of my favorite things to do while in Disney World. Not only do I get to further my collections, but sometimes I’ll get into a really fun or interesting conversation with the cast members. They’re really friendly and fun to talk to. And they may even have the perfect pin to complete your collection. And now I am excited to announce my very first giveaway! I have an official Disney parks lanyard and ELEVEN pins that you can use as your starter pack to trade with in the parks! Please use the rafflecopter widget to get all your entries in (comment on this blog, follow this blog, and like my facebook page - and you must do all three to be entered into the drawing - and there are bonus entries for following on twitter and tweeting about the contest!). Entries must be received by Monday, (May 21, 2012) night and must have a US address for me to send your prize. The winner will be announced on Tuesday. Good luck!! So...what about you? 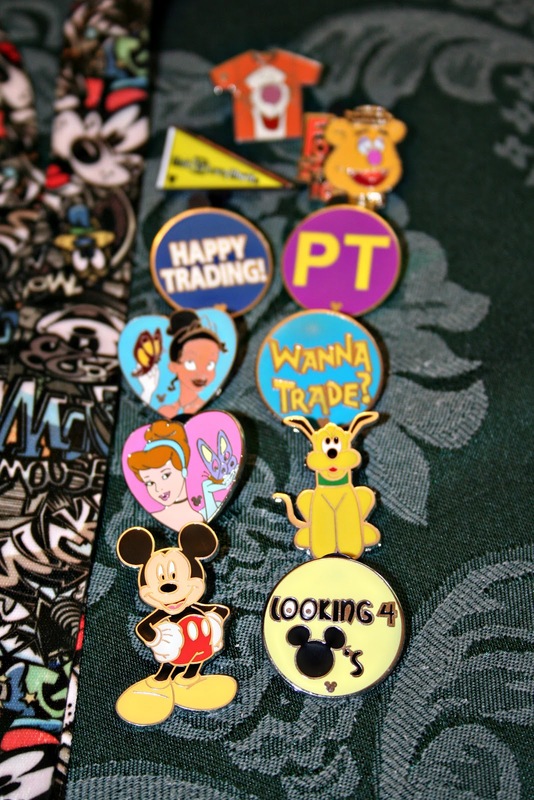 Do you pin trade? What kinds of pins do you (or want to!) collect? I just heard about this a year ago. I so want to do it with the girls. I can't wait to get started. Could you make your own and trade those ? Or is it only cool to get the metal ones? Hi Emily! To trade pins, they need to be official Disney park pins - and they will be stamped that way on the back of the metal pin. It really is a lot of fun to trade - and a great conversation starter! You know I was clueless about it, but this is a really good explanation! And it makes it sound like a lot of fun. You and your daughter did a great job on this post - how fun to read how it all shakes down from a teenager who loves this hobby's perspective. There's more to it than I realized, and I love all the insider tips and explanations she gave! Ok, even I'm thinking I want to try playing pin trading now - thanks for the awesome, fun giveaway! Love the pins they are so much fun! Katie did a fabulous job explaining the ins and outs of pin trading! I didn't tell my girls about pin trading prior to our 1st trip... but at ages 4 and 6, I thought they were too young, anyway. But on the next trip (ages 7 and 9) they were all for it! As the days went by, they got more comfortable going up to the CMs to trade. And you know firsthand that I started pin trading last year! I'm still trying to complete the "Aloha" Chip & Dale set. I think I need just one more! 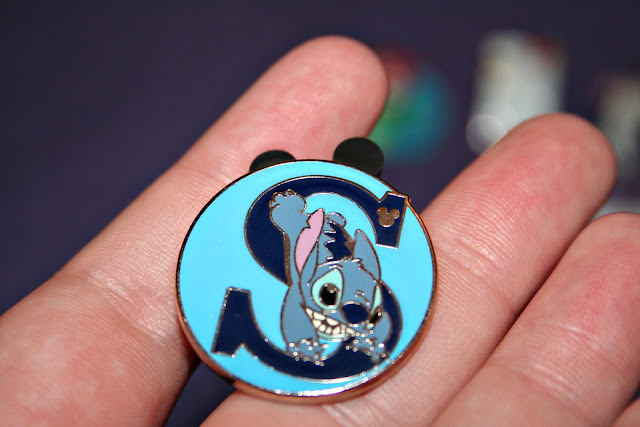 I didn't know there were hidden mickey pins, that's cool! We love collecting pins! Great pictures and review! I've never collected pins...this would be so cool! Hi Katie, anticipating my son would get excited and spend money on pins I started purchasing some to give him as gifts before our trip. I am purchasing him Star Wars theme, my husband patriotic pins and mine are a hodgepodge for trading purchases. Now I'm the one that's gone crazy. Thanks for explaining the different color lanyards the cast members wear and thanks for spreading a little pixie dust our way. Picture of the Week: Disney is not just for kids!